Wake up call is given to sleeping nation. Wake up call is not given to a dead nation. Pakistan is ranked at 154th position in the ‘global ranking’ while Iraq stands at 145th and Syria stands at 137th position in the same area. 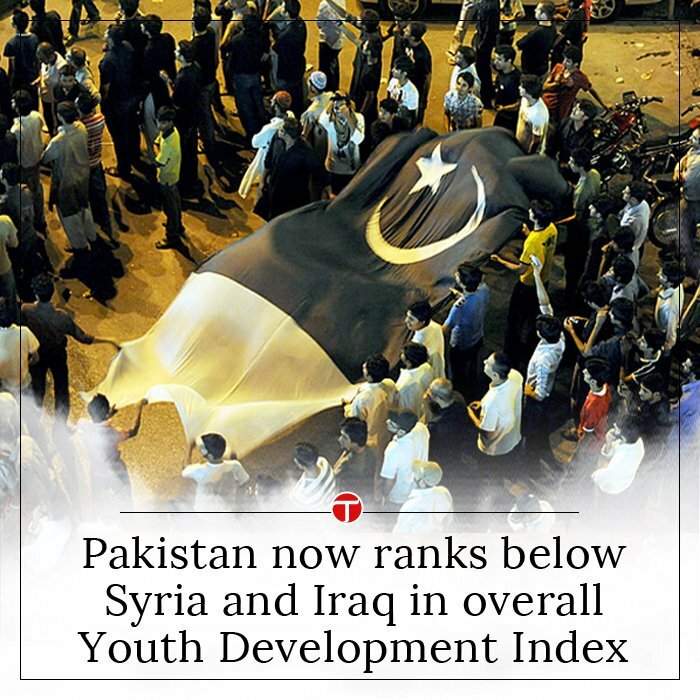 Pakistan ranks far below the two war-torn countries of Syria and Iraq in two domains of the Global Youth Development Index (YDE) report, it was learnt on Sunday. However, it stands in a better position in one domain against both these countries, the federal government states. In overall global ranking in the YDE report, Pakistan is also below the two countries. Pakistan Tehreek-e-Insaf (PTI) MNA Murad Saeed had inquired from the planning and development ministry that whether it was a fact that Pakistan’s rank was lower than Syria and Iraq under the YDE report to which a written reply was submitted and Pakistan’s position was described in the five domains in comparison with the position of Syria and Iraq. The YDE report, developed by the Commonwealth Secretariat, measures the status of young people in 183 countries around the world. The index is a comprehensive measure across five domains that are critical to youth development – education, health, employment, and civic and political participation. It informs policymakers about young people’s needs and opportunities, indicating areas of success and where both attention and investment is needed. It also acts as a data advocacy tool, highlighting the importance of gathering statistics on key youth indicators in order to achieve the Sustainable Development Goals. According to the submitted data, Pakistan is at 156th place in the domain of ‘education’ while Iraq stands at 152nd position and Syria stands at 126th in this domain. In the domain of ‘civic participation rank’ Pakistan stands at 154th position while Iraq stands at 37th position and Syria stands at 97th position, the data submitted by the ministry about the index states. In the field of ‘health and well-being’ Pakistan fares better than Iraq as Pakistan stands at 77th position while Iraq is ranked at 103. However, Syria superseded Pakistan in this area as it ranks at 41st in the same domain. The only area in which Pakistan stands at a better position in the index is the ‘employment and opportunity’ as Pakistan stands at 154th position while Iraq at 183 and Syria 164 in the same domain. In the field of ‘political participation’, Pakistan holds the 165th rank which is better than Syria standing at 172nd, but not better than Iraq which holds the 84th position. The government is of the view that all provincial governments have prepared their own youth policies but this factor was not into consideration in the YDI. Responding to the question of the legislator, the government mentioned a few projects of its own which contribute to youth development in the country. According to the government, the Prime Minister’s Youth Business Loan Scheme, employment generation in CPEC projects, Prime Minister’s Youth Training Scheme, Fanni Maharat Programme, skill development through National Training Bureau and some other projects were contributing to the development of youths in the country. Next articleAli Baba, Chalis Chor and dead nation.